Kim Hollis: Sherlock Holmes: A Game of Shadows opened to $39.6 million, a bit less than its predecessor, which had the calendar advantage of opening on a Christmas weekend. What do you take from this result? Edwin Davies: The calendar configuration is a key factor here since it skews the results in favor of the first film, which took full advantage of Christmas Day falling on a Friday, which led to higher Saturday and Sunday figures. Basically, had the first Sherlock Holmes opened on the weekend before Christmas, as its sequel did, it would have opened to less on its way to the same total, it just happened to have a pretty much perfect calendar configuration for a big opening weekend. That film wound up with a total of $209 million, giving it a multiplier of 3.4. I think that Game of Shadows, which has got decent reviews and great word-of-mouth, will ultimately have a better hold, and whilst it might not match its predecessor, the Christmas box office bonanza means that it won't get shunted out of the way by Ghost Protocol, which has suddenly become its big competition. Bruce Hall: Clearly, it wasn't realistic to expect Game of Shadows to open to quite the same numbers as the original. As we all know, the original opened on Christmas day, giving it a leg up on revenue. But what the Warner Bros spin machine is reluctant to admit is that they expected something closer to the $50 million mark for Game of Shadows. What we had here was a fairly standard sequel that in large part, played it safe and stuck with much of what worked the first time. Unlike the first film there was a strong villain, but if the addition of Noomi Rapace was supposed to be an improvement over Rachel McAdams, color me unimpressed. The two of them together still can't get me out of my chair. I guess first place is first place, and I agree that long term, things will likely turn out well for Holmes and Watson. But I believe Tron Legacy opened this time last year to similar numbers, playing it safe with a ho-hum story that took too many cues from the original. And just as last year, I can't help but feel that a decent but fundamentally underwhelming film got more or less what it deserved. Brett Beach: By way of a preface, it certainly feels to me like there are an overwhelming number of major studio films being wide released around Christmas this year, compared to recent years, although this could be due to the calendar configuration of Christmas Sunday, with releases being staggered on the 16th, 21st, 23rd and 25th. This could lead to some folks ranking their blockbusters in order of preference (and of course all the smaller and expanding Oscar nominee types as well). 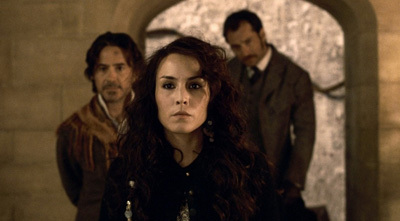 I place myself in the category of those who weren't all that impressed (if not unimpressed) with Sherlock Holmes and have no vested interest or strong desire for the sequel. I do think the advertising went out of its way to highlight all the ways this was going to be like the first, instead of focusing on the unique things that would make this installment. I also agree with Edwin's reference to potential competition from MI:GP, now that that has hype and really excellent reviews. (Is it rare to see big action spectacles opening so close in December?) I don't think this opening result is distressing, but I would be surprised if even the "12 Days of Christmas" carries this over $200 million and/or past its predecessor domestically.